I absolutely love this book. It is written by Gail Doane, a very well respected heirloom sewist, born in Canada, and currently living in the US. Her work is often featured in Australian Smocking and Embroidery as well as other heirloom publications. 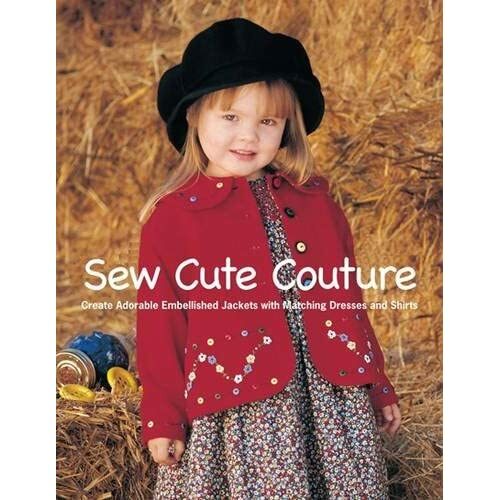 This is a book of ten different smocked dresses with coordinating embellished jackets and sometimes little embellished bags to match. The book is really about the jackets. Doane's mastery of embellishment is incredible. One of my goals is to learn how to do cast on roses and Doane's instructions will get me there. They are so clear and the photography says it all. This book is published by Country Bumpkin, reknown for their fabulous photography and clear instructions. The beautiful child models are right off the pages of AS&E. Patterns are included in a pullout for all of the garments and they run from size 6 months to 12 years. Detailed instructions for rouleaux, fagotted bindings, cast on flowers, are understandable by anyone who can pick up a needle and look at pictures. They are that clear. There is a darling pattern for a swing jacket that I can't wait to make for Carley. I am duly inspired by Ms. Doane's work and can't wait to try one of these patterns. I got my magazines, and Emily got her needles. I can't wait to read them. Thanks so much! I made Emily some cute little sundresses. You can see them on my blog. Thank you for sharing about this book. I can't wait to go to Amazon to buy mine. Sounds like a wonderful book. Will take a look at it on Amazon. OMG! You did have to show us this book! I had no idea she was writing a book, but I LOVE everything Gail Doane does, and even before I saw the author, I was interested. And I don't even have anyone to make these clothes for! At this time anyway. I'm hurrying over to Amazon, as I suspect that the $66 price is the true price, and they'll correct their error soon! Since $15 is roughly the price of one AS&E, and you say it contains 15 patterns? Not only do Gail's clothes look good in photos, they're awsome IRL also! She truly is a MASTER! Add AS&E's models and photograpy and I'm sure it's a winner! P.S. Thanks for the instructions RE: the seam transition! I love this book too. The only jacket I wish had included was the lace jacket. But I love just about everything she does and her classes are even better. This book is available on Half.com too, where I dropped a bunch this afternoon. Saw your post, and I thought I would share a bit of info I found while searching around for something else today. I havent heard anything from her officially but look at what I found! Had my first Gail Doane class yesterday. It was fantastic! She is an excellent teacher. We learned the "Snug as a Bug" jacket construction. I'm getting this book as quickly as possible. Heading for Amazon.